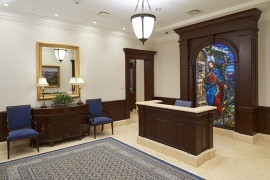 Latter-day Saints in the state of Wyoming will now enjoy worship and work at their own Mormon Temple. 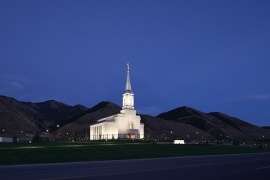 The announcement of the construction of the Star Valley Wyoming Temple was made at the 181st Semi-Annual General Conference of The Church of Jesus Christ of Latter-day Saints on 1 October 2011. 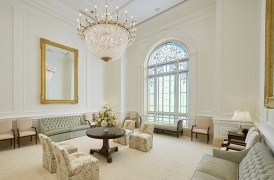 President and Prophet of the Church, Thomas S. Monson, made the announcement. In his remarks, he joked, "I think I'll dedicate that one. There's good fishing up there!" 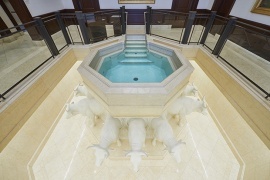 President Michael Allred of the Thayne Wyoming Stake commented, "I think it is important to note that this temple will not just be for members of our faith. This is for all residents of Star Valley and it will be a blessing to this area. The Idaho Falls Idaho Temple, Rexburg Idaho Temple, Twin Falls Idaho Temple, and the Boise Idaho Temple previously serviced Wyoming’s 63,000 Church members. 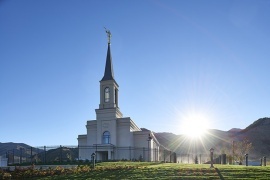 The Star Valley Wyoming Temple is the first in Wyoming and will serve members living in the western part of the state, who now travel approximately 1.5 hours to Idaho Falls and Rexburg, Idaho, for temple services. The journey to the Rexburg Temple from Wyoming was considerably difficult on rural roads with severe winter conditions. The Star Valley Wyoming Temple is anticipated to serve members from the following six stakes: Afton Wyoming Stake, Kemmerer Wyoming Stake, Montpelier Idaho Stake, Montpelier Idaho South Stake, Soda Springs Idaho Stake, and Thayne Wyoming Stake. A final determination will be made before the temple is dedicated. 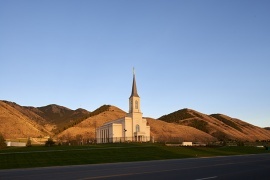 On 25 May 2012, the Church officially announced the location of the Star Valley Wyoming Temple as east of U.S. Highway 89 on the Haderlie Farm property in the town of Afton, south of Star Valley Medical Center, and north of the Star Valley View Golf Course. The Mayor of Afton, Loni Hillyard, said members are "elated at the prospects of a temple in our valley." 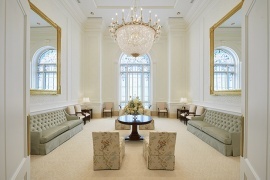 She believes that the temple "will have a positive effect on [the] entire community." Local Church spokesman Jerry Hansen said, "We truly believe this new temple will be a great asset not only to members of the Church but also to the people of the surrounding community, who will benefit from the peace and beauty a temple brings." 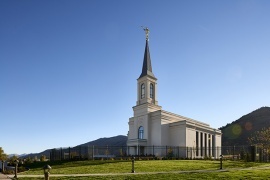 On 30 April 2012, Star Valley Independent reported that a letter from the Presiding Bishop to Mayor Hillyard had earlier confirmed the location of the temple. The letter proposed development of a portion of the site to construct a temple and requested a variance to the building height restriction of the zoning ordinance to accommodate a spire. "The actual temple is not too tall, it will just be the steeple," Mayor Hillyard said. "Our flight path maximum is 45 feet so they are going through this variance process. I do not anticipate a problem. It is so far up the hill away from the airport I don't think it will be an issue." 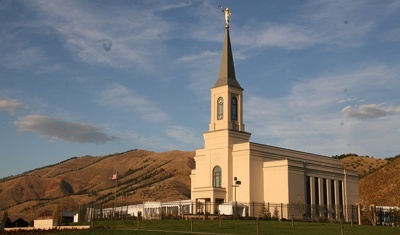 According to LDS Church Temples, the Star Valley Wyoming Temple was prophesied by Elder Moses Thatcher of the Quorum of the Twelve Apostles. Thatcher first came to the valley in the late 1870s looking for a suitable location where colonizing Latter-day Saints could settle. Looking over the beautiful valley, he declared, "I hereby name this valley, Star Valley, because it is the star of all valleys." 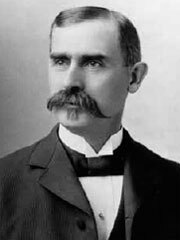 He later returned with Elder Charles C. Rich, a senior apostle, to dedicate the valley as a Mormon settlement. A fine tract of bench land on the eastern portion of Afton will afford a beautiful site for a Temple hereafter to be built, as per prophesy of Elder Moses Thatcher. This bench lies at the mouth of Swift Creek canyon, from whence flows a large stream of pure water, flanked on either side by a park of beautiful swamp pines, many of which are more than 100 feet high. The history of the Church in Wyoming is rich and interesting. Mormon pioneers traveled westward through the state first in 1847, following the Oregon Trail to Fort Bridger. The first party of travelers stopped at Fort Laramie to repair their wagons. They used rafts to ferry themselves across the Platte River, and nine men stayed behind to continue working what became a profitable ferry. Most traveling parties made it through Wyoming without trouble, but the Willie and Martin Handcart Companies of 1857 got trapped there in winter snowstorms. Of the 1,075 people in those companies, roughly 200 tragically perished before the rest were rescued by Saints from Utah settlements. Today, three monuments stand in memory of the Willie and Martin Handcart Companies and a memorial site, dedicated by former Church President Gordon B. Hinckley, rests at the mouth of Sweetwater Canyon where 21 Saints died in a single night. The first Mormons of record arrived in Star Valley from England in 1858 to labor on the Lander Cutoff. By 1870, Church cattle were pastured in the valley. Church members settled in the Star Valley area in 1877 and then Church President, Brigham Young, dedicated it as a gathering place for Latter-day Saints the following year. In 1879, a directive was issued to colonize the Salt River Valley—renamed Star Valley the next year. Members were first organized into a branch of the Bear Lake Stake. In 1892, the Star Valley Stake was organized with 7 wards. The 140-foot Star Valley Tabernacle, which still stands in Afton, was dedicated on 15 August 1909, by President Joseph F. Smith. There are now two stakes of the Church in Star Valley - the Afton Wyoming Stake and the Thayne Wyoming Stake. These stakes currently belong to the Idaho Falls Idaho Temple District. On 14-15 August 2009, the centennial celebration of the dedication of the Star Valley Tabernacle was held, beginning with 100 rings of a pioneer church bell and the shot of a cannon. A 70-voice Star Valley Tabernacle Choir initiated the celebration with a concert featuring special guest Tom Osmond, whose great-grandfather, George Osmond, Jr., was the first President of the original Star Valley Stake. An organ solo was also performed on a pipe organ acquired from the Idaho Falls Idaho Temple in 1987. Saturday began with a 10-mile bike-a-thon from the tabernacle stone quarry to the tabernacle. Other activities included a ceremonial flag-raising, patriotic concert by a Centennial Brass Band, and numerous indoor and outdoor festivities. 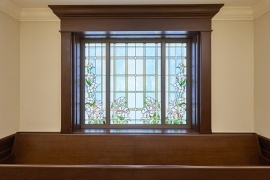 A display in the tabernacle featured historic photographs, tools used in construction, and a video of historical and modern views of the tabernacle. The celebration ended with the unveiling of artifacts from a time capsule that had recently been discovered in the tower cornerstone. The groundbreaking services for the Star valley Wyoming Temple took place on Saturday, 25 April 2015. Thousands of Church members and friends gathered to the site to witness the event. Many more joined by satellite and Internet transmissions. 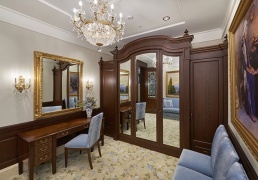 Elder Craig C. Christensen of the Presidency of the Seventy presided. He was accompanied by Elder Kent F. Richards of the Seventy and Executive Director of the Temple Department. Several community and civic leaders also attended. Construction of the temple is expected to last approximately two years. 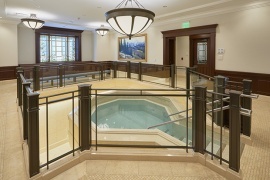 Elder Christensen remarked, "There couldn't be a more appropriate place for a house of God. The temple is a gift of God. It is to the great heritage that is here... It links generations together. 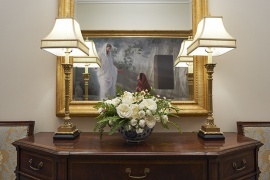 The temple will become a landmark, a sacred place for this valley for years to come.” Elder Richards further commented, "[The temple] isn't a monument to the past; it is a new beginning. It is a beginning of faith and courage of your generation and your children and your future. Everything we do is to prepare ourselves for the temple." 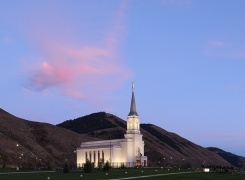 The Church of Jesus Christ of Latter-day Saints has announced that the placement of the Angel Moroni on the Star Valley Temple will take place at 11 a.m. on Monday, 25 April 2016. The temple grounds and construction site will not be open to the public. The placement of the angel Moroni will take place exactly one year from the groundbreaking which took place on 25 April 2015. Although not required, this iconic symbol of The Church of Jesus Christ of Latter-day Saints stands high atop most of the 150 operating temples worldwide. The First Presidency of The Church of Jesus Christ of Latter-day Saints announced that a public open house for the Star Valley Wyoming Temple would be conducted from Friday, 23 September to Saturday, 8 October 2016. The open house was held every day except Sundays and the evenings of September 24 and 25 and October 1 and 2, 2016. During the three-week open house, from 23 September to 8 October 2016, 78,000 people visited the temple. 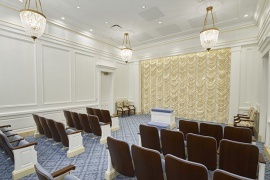 The following pictures from LDS.org of the inside of the Star Valley Wyoming Temple were officially released by The Church of Jesus Christ of Latter-day Saints on 30 October 2016. More than 1,200 youth gathered from throughout the temple district in western Wyoming and parts of Idaho on Saturday, 29 October 2016, the evening before the scheduled dedication of the Star Valley Wyoming Temple. Dancing to and singing songs of pioneer legacy and of faith, they performed for hundreds crowded into the gymnasium at Star Valley High School in Afton located just a few blocks from where the temple stands on Highway 89 in this "star of all valleys." The performance was titled "Mountain Heir: Clean and Pure." Cultural celebration director Wendee Graham related that the performance reflected "our feelings that we are blessed by those who have come before," referring to the pioneer heritage of Wyoming. "We are heirs to their dreams, to their hard work, to their sacrifices." Speaking about the theme, which symbolized both the clean and fresh mountain air of Star Valley and being "clean and pure" heirs to the blessings of the temple, Sister Graham told the Church News, "We are having a mountain top blessing. We’re heirs to this temple, and we’re also heirs to this valley." Elder David A. Bednar of the Quorum of the Twelve Apostles and his wife Susan K. Bednar who was raised in Afton, Wyoming, were in attendance for the Saturday evening performance. 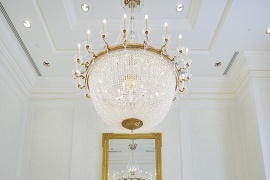 During his remarks, Elder Bednar said, "The Lord has blessed this area with a temple. That’s a remarkable blessing and I have an invitation for each one of you young women and young men. It’s really very simple. Please live worthy so that all throughout your teenage years you would always be worthy to enter into the temple to perform baptisms for the dead. Always." 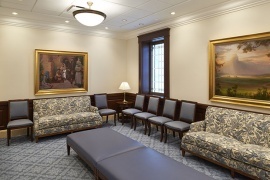 He continued, "Please be worthy to enter in the Star Valley Wyoming Temple or any other temple in this Church so you can perform ordinances for your own ancestors." Also attending the performance was Elder Ulisses Soares of the Presidency of the Seventy, General Authority Seventies Elder Wilford W. Andersen, Elder C. Scott Grow and Elder Larry Y. Wilson, who is executive director of the Temple Department. Wives of the visiting authorities, Sister Rosana Soares, Sister Kathleen B. Andersen, Sister Lynda Wilson and Sister Rhonda Grow were in attendance. In addition, U.S. Representative Cynthia Lummis of Wyoming was in the audience. 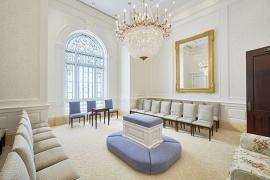 Elder David A. Bednar of the Quorum of the Twelve Apostles presided over the dedication and traditional cornerstone ceremony on Sunday, 30 October 2016, of what is now the church’s 154th operating temple and the first temple in Wyoming. Members of the church from throughout the temple district in western Wyoming and parts of Idaho participated in three dedicatory sessions held at the 18,000-square-foot new edifice, which sits on the east bench of Afton. Latter-day Saints also watched dedicatory proceedings broadcast live to meetinghouses in many parts of Wyoming and into southeastern Idaho. The temple was formally dedicated in 3 sessions - at 9:00 a.m., 12:00 p.m. and 3:00 p.m.
With the dedication of the new temple, President Mark Taylor, chair of the local temple committee, declared, "Now it’s time to get down to the business of temple work." This page was last edited on 1 November 2016, at 10:00.